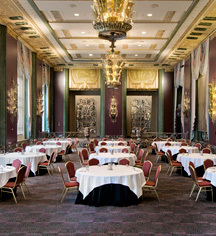 The hotel offers more than 40,000 square feet of flexible space, including three incredible ballrooms with breathtaking French art deco features and 27 additional meeting rooms strategically located throughout the facility (including five Executive Boardrooms with leather high-back, five point chairs). High speed & wireless high-speed internet service is available in all meeting rooms and the hotel also offers a full service business center with high-speed internet access, computers, fax, copier, mail and postage services. Audio-visual equipment, including webcasting, video conferencing, podiums, portable and built-in whiteboards, audio visual equipment and services are available in-house. 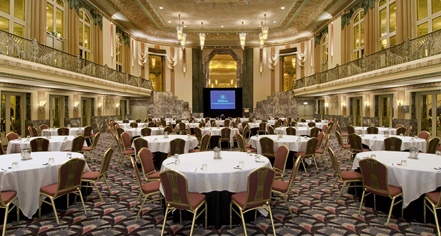 The Hilton Cincinnati Netherland Plaza is a AAA Four-Diamond Hotel and has been voted by Meetings Media's meeting planning audience as "Best of the East" for five consecutive years (2006-2010) and is a five-time Meetings & Conventions Gold Key winner. In 2010, the hotel was named Hilton Hotel’s #1 hotel (500+ guestrooms) for “Award of Excellence – Food and Beverage”. This award was based on food quality, selection and service in the restaurants, room service and meeting/banquets. Also in 2010, Executive Chef Todd Kelly was named one of Hilton’s “Signature Chefs” – just one of six in the US successful and memorable event!